Great quality and looks wonderful. Comfortable to carry, and has some compartments inside to manage small items. I like the magnetic closures and the sizable front pocket. 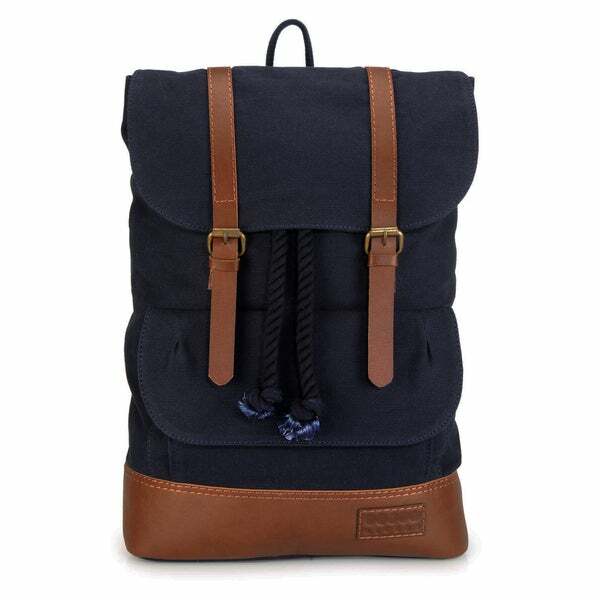 Bridle-leather trim underscores the vintage appeal of a sturdy canvas backpack inspired by old-school forestry packs. Crafted from durable canvas and pure leather trims, it comes with multiple pockets. We give you the convenience of a water-resistant laptop sleeve to keep your tech safe and dry. A padded back and shoulder straps ensure comfortable carrying around town, on campus or out on the trail. Story Behind the Art: Our creations are untouched by machine, and crafted by men. each one of our five artisans is allowed togive his full attention to the minutest element. from the texture and grain, to the size and width, no part of our material is left without scrutiny. genuine leather is clipped with unwavering precision a thousand times over till theperfect cut is realized. every piece is mancrafted by hand, in our own distinct style, with a delicate finesse that moulds separate pieces of our exquisite natural leather together as one, giving that unique look. setting leather trends has been our creed and it's a belief that reflects in all our distinct designs. we bring you the best in fashion every month, with moods, trends and silhouettes inspired from the fashion ramps in milan, paris, berlin, london, new york and tokyo.